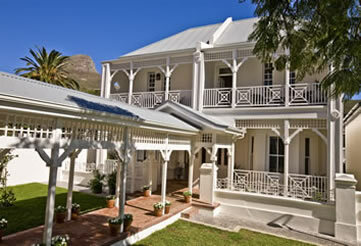 One of Cape Town�s most traditional hotels is surprisingly family-friendly. We took a walk through its nine-acre garden and checked into one of its spacious family suites to find out why. The Nellie, as it�s affectionately known by Capetonians, is a familiar meeting place for many of us who do business in town. And whether it�s a breakfast meeting at The Oasis overlooking the pool or sophisticated drinks at the contemporary Planet Bar in the evening, it�s always a pleasure to walk in and be swiftly swept up by its old-world ambience and gracious welcome. With kids, it�s a little different. 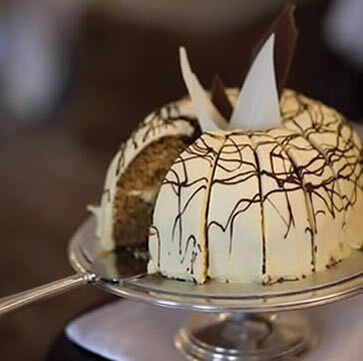 Before you know it, they�ve snuck past the concierge and are on their way to the cake table ahead, where the genteel tradition of high tea begins. But for the first time, as I catch up (now in mother mode), I notice happy reunions of families and friends, while grannies thrive on the attention of adoring grandchildren. The atmosphere�s relaxed and instant relief washes over me. We�re off to a good start. 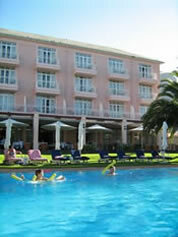 It�s Easter Sunday, the weather is spectacular, and the pool attracts children of all nationalities like bees to honey. Language aside, instant friendships are struck between mini guests and every so often they trail off into the garden all drippy and wet to meet an Easter bunny or watch a magician. I settle deeper into my lounger, pull my hat over my eyes and savour some �me time�. Gales of laughter sweep across the lawns, glasses chink and, as if by magic, a serene bride quietly appears. Perhaps it was just my relaxed state of mind but as I made notes and people-watched, it struck me that this is what the Nellie does best and has done for years. At this point, my son races over and tells me that I missed out big time - the magician clearly got his vote (which is saying something, as he'd rather be going to the local School for Magicians than wearing a tie everyday). One would never have guessed that at the same time celebrity guests were being ushered into the Presidential Suite. Glam wedding guests and musicians mingled on the wedding lawn as the sun set and, when we could finally persuade them to leave the pool, the kids slipped back upstairs with us ready for their dinner. Knowing that the kids were enjoying in-room dining while being cared for by an experienced childminder, we slipped downstairs again to the Cape Colony, the hotel�s elegant restaurant. (The kids were utterly charmed by the trolley that rolled in with their food and which folded out into an elegant dinner table for two). At the Cape Colony, dinner can be booked at a romantic table overlooking the garden or, if you�re with friends, at the Chef�s Table in a cosy corner of the capacious kitchen, which is an altogether unforgettable experience. You enter to noisy fanfare � the welcome by kitchen staff is done naval-style with an arch of copper pans, which are banged noisily with wooden spoons as you walk beneath them! I never thought I�d be tempted, after a delicious two courses and some robust, full-bodied wines, but Yunus Natherson, our persuasive waiter, raved about the apple dessert. We agreed, curious to see what the humble apple could offer. It was, as Yunus promised, light as a feather. A few days later, Chef agreed to share his recipe with us. The informal buffet-style breakfast at the Oasis, overlooking the pool and gardens, is a stress-free way to start the day, as children can play while parents relax. And while the day is still cool it�s a good idea to book into the new and stylish Librisa Spa conveniently adjoining the pool area. The spa deserves a special mention for including Kiddies Spa Treats, for the �young spa enthusiast�. Highly recommended: a pedi or mani for mum with a sparkly mini mani or pedi for little one. For pedicures, all girly princesses sit side-by-side with their mums on regal chairs upholstered in Deco-inspired silvery fabric. Lavender and Aloe Cinderella facials or Cocoa Fizzy Fairy Masks are also fun and completely natural. Or, book yourself in on your own for a holistic package for several hours of blissful pampering, and unwind before or after treatments at the private sauna, steam room or plunge pool � the perfect way to start or end a family holiday. 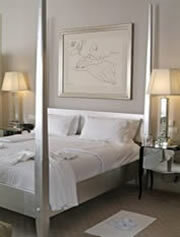 Setting Nestled in the heart of the City Bowl, with views of Table Mountain and set in a nine-acre garden sanctuary. 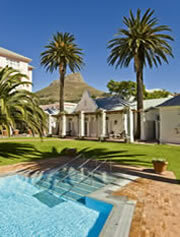 Why we love it She�s the grande dame of hotels in Cape Town and acts like it. Sometimes she couldn�t give a damn about her age (she surprised everyone with the opening of the contemporary Planet Bar) and other times, she�s awfully proper, continuing with quaintly charming traditions such as high tea. The beautifully decorated and designed Librisa Spa has recently opened at the Mount Nelson and welcomes Day Spa visitors. 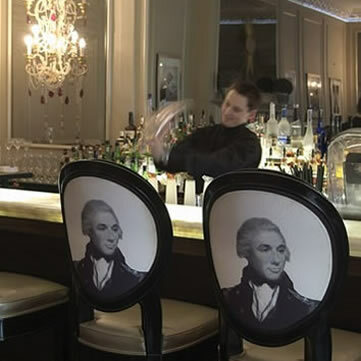 We think the Planet Bar is one of the most elegant spots in town to meet for drinks. Two suites have been purpose built for physically disabled guests. Wow factor For kids: the pool and the spacious garden. Interconnecting family-friendly suites are also wonderfully spacious. Best rooms or suites to book The hotel has 57 suites and 144 bedrooms in six individual accommodation wings, each with their own d�cor styles, private gardens and facilities. Check out their website before booking. The Penthouse Suite is more contemporary and has spectacular views. 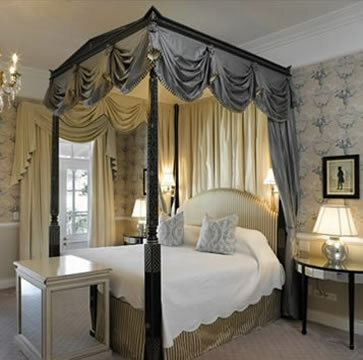 The best rooms to book with children include any interleading room in Green Park, rooms 174 and 175 for proximity to the restaurant and pool, or, rooms 903 to 906 in the cottages (although children under 16 can't use the pool outside the cottages - they need to swim at the main pool). Room for improvement We hope, in future, a greener policy on lighting (our suite was fully lit to welcome us on arrival). We were, however, delighted to discover that the hotel is registered with the Heritage Environmental Rating Programme that assists hotels that are committed to a more responsible and sustainable business practice. Given the choice, I guess I would rather have had warmer bathroom floors than 'welcome' lighting. How to get there Fly into Cape Town International Airport and transfer to the hotel by car (20 minutes off-peak, and approximately 50 minutes in peak hour). The airport is 19km/12 miles from the hotel. Detailed directions are on their website, as well as train information if you are arriving by Blue Train or Rovos Rail. A complimentary shuttle service is available to trips within a ten-kilometre radius of the hotel between 9am and 9pm daily. Booking necessary. The Mount Nelson Hotel is part of the Orient Express Hotels Trains and Cruises Group. 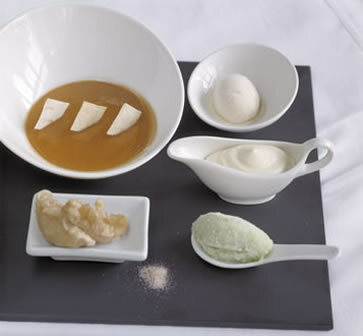 I begged the chef for the recipe of their delicious Apple dessert, which he obligingly gave me, secure in the knowledge that only a top-class restaurant or dedicated cook can reproduce it to perfection ... see what you think! Apple Dessert Is it red or is it green? Heat the cream and milk together. Make a caramel with the sugar and water. Add the warmed milk mixture to the caramel. Mix the egg yolks and milk mixture together and add the apple pur�e. Strain and pour into bowls and bake at 160�C until set. Leave to cool in fridge. Pour over melted apple jelly and leave to set. Peel and quarter the apple. Remove the core and halve again. Poach in apple juice and cinnamon sticks until just cooked. Remove excess liquid, dip in flour and then tempura batter. 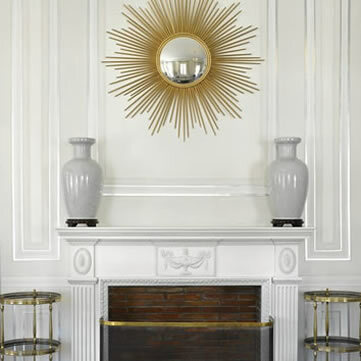 Fry until golden. Heat apple juice and vanilla pot in a pot. Whisk in the soaked gelatine leaves. Use half to put on top of the custards and the other half put in fridge to set. When set put in a spuma gun and �spray� into a bowl just before serving. Thinly slice the apples and then cut into small squares. Sprinkle with lemon juice to prevent browning. Grease a baking sheet and dust with icing sugar. Put the squares on the tray and bake at 180�C until dry. Put into air tight container until required. Slice apples and freeze overnight. Make stock syrup with equal quantities of sugar and water. Process the frozen apples in blender. Mix in the stock syrup and Calvados and churn in an ice-cream machine. Follow an ice cream base recipe and method, but add strained apple pur�e (apples cooked in apple juice till soft and then blended). Lay out each dish on a flat, square plate and serve. We also applaud the Hotel's Housing Trust which has been set up to assist with the demand for sub-economic housing throughout South Africa. Donations are welcomed and can be debited off the hotel bill. It has since raised over ZAR 1 million for the charity. Funds raised are managed by Habitat for Humanity. The now famous five-star wormery at the Mount Nelson is an exciting hotel vermiculture initiative. The classiest worms in town get to work daily on natural composting of fresh vegetable waste (what�s known as pre-consumer waste � potato skins, apple cores etc) from the hotel�s kitchens to produce a worm �tea� (vermitea) that keeps the hotel�s gracious gardens healthy and eco-friendly. Head gardener, Paul Rice, is delighted as earthworms know just what plants need and their compost is taken up far more efficiently than any other. Mmmm� we think every hotel and home should be worm farming. This wormery is the brainchild of two local experts: Mary Murphy and Roger Jacques www.fullcycle.co.za. Mary has also written a book for children called Alfie the Earthworm and his best friend Nellie (a pink Elephant), which is available at the hotel.